Doctorate of Physical Therapy from the University of Dentistry and Medicine, Newark, NJ. In 2007 Brandon received a Bachelor degree in Health Science from Quinnipiac University, Hamden, Connecticut. In 2010 Brandon completed his graduate education, attaining a Doctorate of Physical Therapy from the University of Dentistry and Medicine, Newark, NJ. Post-graduation Brandon worked for 4 years at Temple University Hospital, Philadelphia, PA. The work experience at Temple included neurology (e.g. stroke, traumatic brain injury, and spinal cord injury), cardiopulmonary rehabilitation, prosthetic/orthotic training post amputation, and orthopedics. 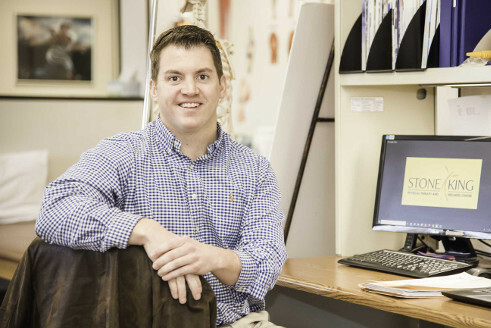 In December, 2014 Brandon joined the physical therapy practice of Stoneking Physical Therapy and Wellness – a business where his father, Richard Stoneking, has maintained an independent practice since 1989. On a personal note, Brandon is an avid Philadelphia sports fan, a current member of the Rotary Club of Trenton, member of the Princeton Tigers Business Network International organization, and enjoys outdoor pursuits such as hot air ballooning, fishing, hunting, skiing, bagpiping and farming.